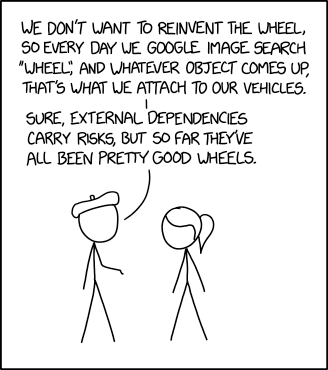 ベレー帽: We don't want to reinvent the wheel, so every day we Google image search "wheel", and whatever object comes up, that's what we attach to our vehicles. ベレー帽: Sure, external dependencies carry risks, but so far they've all been pretty good wheels. Alt-text: Right now it's a bicycle wheel, so we've had to move to lighter vehicles, but the reduced overhead is worth it. There was one week when a wheel of cheese got dangerously close to the first page, though. Reply to all newsletters with "Thank you for the newsletter!" Reply to HTML emails with "Whoa, buddy, what's all this code?" Alt-text: What are all these less-than signs? What's an HREF? Look, we know you live in a fancy futuristic tech world, but not all of us have upgraded to the latest from Sun Microsystems. 男: I wrote a script to automate that thing. 欄外の声: ...Wait, you wrote it? 男: Wanna see the code? ポニーテール: I would, if you hadn't said that in the tone of voice of "Wanna see a dead body?" 男: My code is sort of similar to a dead body, in that you can either come look at it now, or wait a few weeks until it becomes a problem. ポニーテール: And because you're lucky that the people around you understand that they create more problems than they solve. Alt-text: And because if you just leave it there, it's going to start contaminating things downstream even if no one touches it directly. 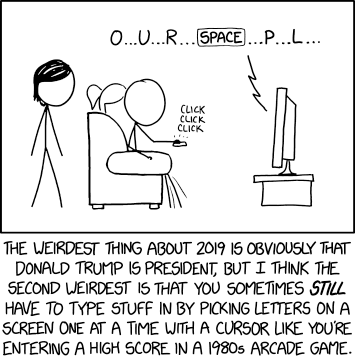 xkcd: Wanna See the Code? Alt-text: I like to think that somewhere out there, there's someone whose personal quest is lobbying TV providers to add an option to switch their on-screen keyboards to Dvorak. 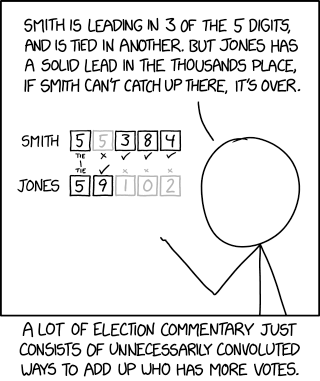 Alt-text: This really validates Jones's strategy of getting several thousand more votes than Smith. 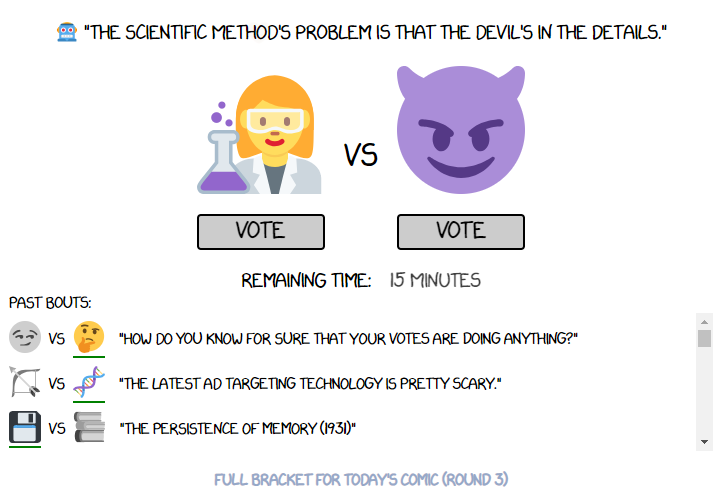 In retrospect, that was a smart move; those votes were crucial. Alt-text: I think Voyager 1 would be just past the event horizon, but slightly less than halfway to the bright ring. 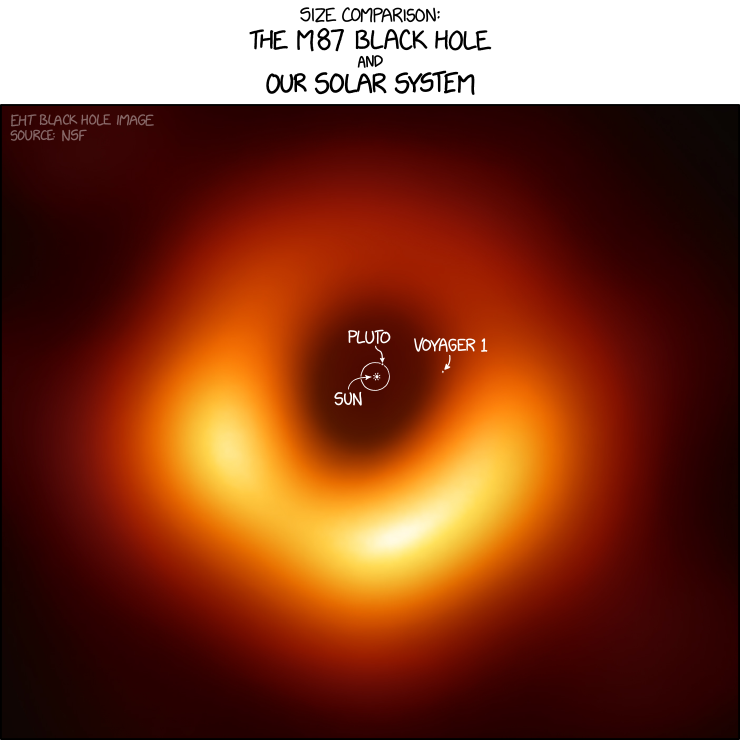 男: The first image of a black hole! 欄外: Can you share the picture? 男: Turns out our telescope feed is like Pinterest, where you can't right-click to save an image. 男: So we tried to take a screenshot, but the key combination kept turning off the display instead. 男: I grabbed my phone and tried to take a picture of the screen, but I was too slow. The observation had ended. 男: We're planning to try again next year, and we'll definitely record the screen this time. Alt-text: [five years later] Ok, it seems we were accidentally zoomed in slightly too far. But imagine there's a cool-looking twisted accretion disc just outside this black square! Alt-text: In a tribute to classical Latin, I started pronouncing it 'per-kent.' Eventually my friends had to resort to spritzing me with a water bottle like a cat to train me out of it.